If you're looking for some ski fun during the next few weeks, look no further than Whiteface Mountain! As February leads us into Spring-thinking, the mountain has a few really fun things to offer up to skiers and riders. Entertainment reigns in the Cloudspin Lounge with great regional bands performing every Saturday during the season. For some great entertainment, show up around 2:30pm to catch the live show. This coming week's entertainment features Swampcandy on February 21st. Don't miss the upcoming bands as well as Whiteface rocks you through the Spring skiing season. Although not really qualifying as an "event", the Whiteface Bag Jump is nonetheless something you should try out if you're looking to improve your freestyle or freeriding skills. The video at the top features the Bag Jump. You can pay by the jump for $5 each, or buy a daylong pass for $15. You'll need a lift ticket to access the Bag Jump. It's been 32 years since Whiteface has hosted a big NCAA skiing event. This year, the NCAA returns to the Olympic mountain for Division I National Championships on March 11 - 15. Nearby St. Lawrence University will act as host college at both Whiteface Mountain for alpine events and Mt. Van Hoevenberg for the nordic events. 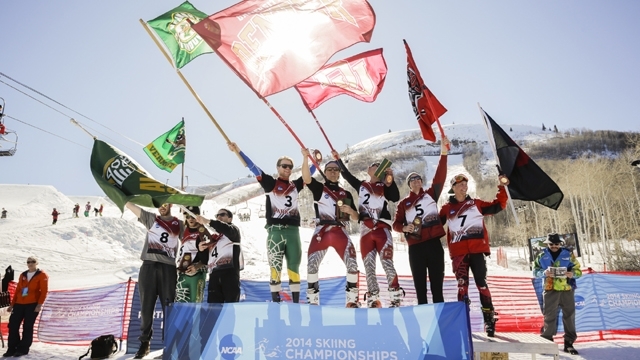 You'll get to see the finest college skiers in the US during this elite ski event. Colorado's Denver University will be defending its title as top team in the US in 2014. Beginning on Febuary 28 and running all the way through mid-April, Whiteface Mountain will celebrate Spring with their annual Spring Fest. Kicking off these themed weekends will be Mardi Gras on February 28 - March 1. Each subsequent weekend will feature a theme - Canadian Weekend, St. Paddy's Day, Reggae Jam, Maple, Retro and the last one being a surprise theme to be announced. From live entertainment at the Rock the Face Series each week, to kids races, maple tastings, pond skimming and much, much more. You won't want to miss the fun of Spring Fest at Whiteface. Stay close to the action in the Whiteface Region and enjoy all it has to offer. Lodging options abound and the region also features some great dining and partying spots. Make plans today and we'll see you on the slopes!